The idea of closing down Guantanamo Bay and transferring its detainee population to the United States was supposed to be dead. But someone forgot to tell Congress’ independent research agency. At the behest of a powerful senator, it’s exploring “the ability to house Guantanamo detainees in the U.S.,” according to an internal document acquired by Danger Room. The results are slated for publication eight days after the presidential election. President Obama’s efforts to close Guantanamo Bay ran into a buzzsaw of congressional opposition early in his administration. Funding bills for a host of applicable federal agencies, since signed into law by Obama, forbid transferring detainees from Guantanamo into any prison or detention center inside the United States. Congress has also blocked cash for an administration proposal to purchase a maximum-security prison in Illinois to house the detainees (although last week, the Justice Department quietly purchased that very prison). All of which makes it more notable that Sen. Dianne Feinstein, the California Democrat who chairs the influential Senate Select Committee on Intelligence, requested the GAO study. 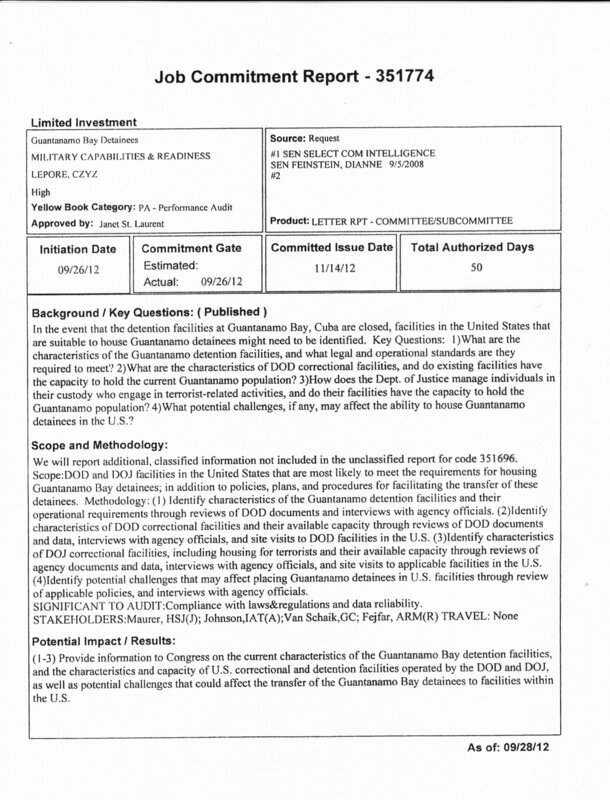 Feinstein prompted the agency, apparently as far back as September 2008, to ask about the technical requirements for keeping the suspected terrorists at Guantanamo Bay detained and whether “existing facilities” inside the U.S. have the “capacity to hold the current Guantanamo Bay population.” The report, Feinstein’s office confirms, is slated for completion in November, although it would not substantively comment further. “We do have work underway on Guantanamo and alternative detention options, but it is not complete. We expect to be done by mid-November. That work will need to undergo a classification review, so it is unclear when it might be publicly available, if at all,” GAO spokesman Ned Griffith tells Danger Room. The fact that GAO is conducting the study points to the biggest obstacle to closing Guantanamo: Congress. But conducting a study and getting recalcitrant legislators to actually embrace shuttering the detention center are two very, very different things. “There’s no plausible way to close Guantanamo without bringing at least some, and maybe many, detainees from there into the United States, and Congress has blocked off that option,” says Matthew Waxman, a former detainee policy official at the Pentagon. 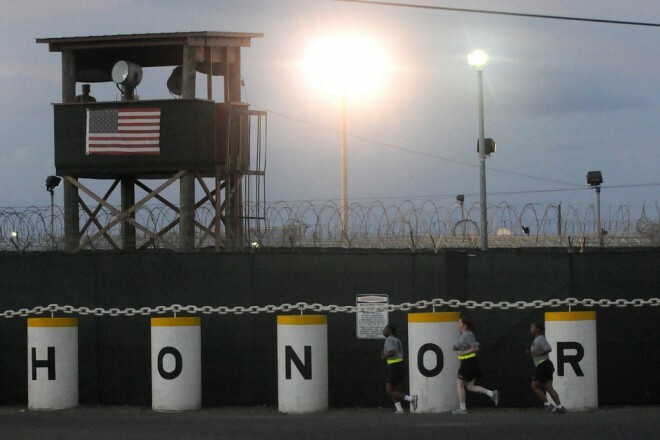 Guantanamo Bay is simultaneously a unique facility and a technologically derivative one. It’s unique in the sense that no U.S. detention facility outside the battlefield of Afghanistan exists solely to house people suspected of terrorism. Relatedly, no U.S. facility outside of a warzone detains anyone without charging them with a crime, as Guantanamo does, although Guantanamo Bay also hosts military tribunals for the relatively few detainees whom the Defense Department has charged with violations of the laws of war. Technologically speaking, however, Guantanamo Bay isn’t unique. Two of its most recent pseudo-jailhouses (“jail” is for convicted felons, which Gitmo detainees aren’t) are modeled on federal maximum-security prisons inside the United States. The camera suites, remotely operated doors and cell structure of the highest-security Guantanamo “camps,” as they’re known, aren’t fundamentally different from those of federal prisons. There are also lower-security detention lodgings, such as Camp 4, where docile detainees live communally, rather than in single cells, although even their workouts are constantly monitored. What makes Guantanamo Bay unique is politics. President Obama signed an executive order during his first days in office pledging to close the facility within a year. Those plans foundered after meeting sustained opposition from legislators wary of bringing suspected terrorists to prisons inside the United States, particularly to the Thomson Correction Center, an Illinois maximum-security prison that the administration proposed to purchase and transform into what critics dubbed “Gitmo North.” Most significantly, legislators — sparked by an aborted plan to try 9/11 conspirators in federal court — wrote provisions into funding bills for the Defense and Justice Departments stipulating that no cash could go to moving any Guantanamo detainees onto American soil. Nearly 800 people have been detained at Gitmo. Of those, only 166 remain. Which raises issues about how low the detainee population can go before it’s no longer worth holding the suspects in Cuba. “Many people recognize it’s an unsustainable thing, having a 2,000-person task force taking care of a dwindling number of detainees,” says one former U.S. official. “You wind up with a Rudolf Hess problem,” referring to the former Nazi who spent decades as the sole inmate of Berlin’s Spandau Prison. U.S. military officials have improvised with the few detainees they’ve collected since Obama took office, such as sticking a Somali suspected terrorist in the hold of the USS Boxer for several weeks in 2011. Last year, Adm. William McRaven, the overall commander of U.S. special operations forces, urged Congress to come up with a permanent system for what to do with terrorism detainees. Without either a clear plan for closing Guantanamo or for opening an alternative detention facility, U.S. forces have basically given up on trying to hold terror suspects long-term — unless they’re picked up in Afghanistan. It’s one of the major reasons why the Obama White House has embraced drone strikes; there’s no place to put a live detainee. A former U.S. official speculates that may be part of the push for this new GAO report. “If you’re not going to open up Guantanamo to new transfers, then what’s the capacity in DOJ or DOD to handle new detainees?” he asks. Matt Lehrich, a White House spokesman, declined to speculate on the prospects for actually closing Guantanamo. “But our position that it should be closed because it’s in America’s national security interest is unchanged,” Lehrich says. It might take more than a GAO study to convince Congress, though.